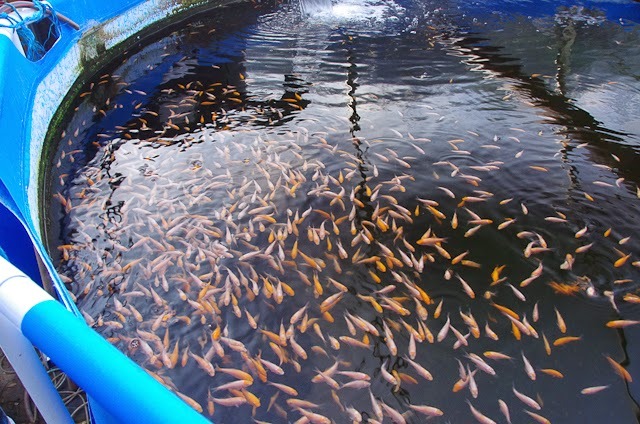 It's been a week of feeding and growing the fry and young kohaku babies. The new batch of fry were sporting a little pectoral fin damage, probably from the cage net and perhaps some parasitic involvement giving them the irritation to rub against the net - so I've released them all into the pond, taking them through a set of treatments and will grow them all on for the next few weeks and then perform my selections, and decide which to keep, and which ones to move on. They have their own pond system, so are isolated from the adult fish and the other fry and young kohaku's that we've been moving on. The other big news is - I will be exhibiting at two koi shows in September. The first is next weekend - the Kangei Koi Club Garden Show. The fish don't need to go anywhere to enter - the judge and photographer come to our pond and all the other club members who enter over the weekend, and take a picture of the fish entered into the show. The judge reviews them, writes some notes - then over the coming weeks, reviews all the photos of everyone's koi and makes the judging decisions. Results are out in December. At the end of September is the South East Koi Club's annual open show, the "All England Koi Show". This is open to the public, and one of the most - if not the most - popular show in the UK. It's in Kent, and well worth a visit if you've never been to a koi show before. The standard of koi entered is usually at the highest standard seen at any koi show in the UK - which makes my life even tougher! 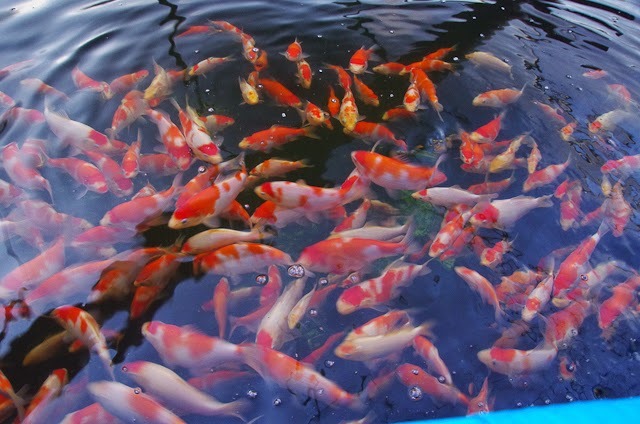 But, with the kohaku babies well above the minimum 15cm size restriction - and with one or two that might be worth showing, and with my stated project aim to win a prize at a koi show beating at least one other koi in the process; it's a must do to take them along and see whether I win anything. The decision will be tough - because taking them to the show means removing them from the growing cycle that's working well. But, I think there'll be at least one tancho and one kohaku that will be up to the trip and worth showing in the 15cm to 25cm size group. I think my best chance for awards in the smaller size groups will come from my smaller babies - the "vortex" ones; but they'll probably be under 15cm still and their time will come next summer. The kohakus that are pushing 20cm already - I wonder whether I'm best to hold onto them until they're much larger and show them at the 40,50cm or even larger level. I'll assess the fish on on the morning of the show and make my decision then. I'll be at the show over the weekend, and please say hi if you are there.